Props to J-Triumf, btw, for coining the phrase "FUKU YEAH". I thank him for it and will now beat it into the ground via repetition. Congrats Fukuchan for making the cut! I just noticed some weird parallels between Mizuki and Fujimoto. - Miki was part of the 6th Generation, Mizuki is part of the 9th Generation. Both 6 and 9 are divisible by 3. - Both the 6th Generation and the 9th Generation had four members. - Their given name and family names start with the same two letters. Fujimoto Miki and Fukumura Mizuki. Amazing how much protectiveness new members bring out in Shirenu and me. Especially when it comes to Princess Fukuchan! I comfess, I read this and the first thing that I thought of was..."Has MM just gotten itself a new groper?" I took it on myself to try translating Nakky's posts on the 9th generation. Maybe I'll do Chisato's tomorrow. Well then, here we go. with their dancing to help us pump up the crowd! I've realized what a happy feeling this is! Sayumi posted on her blog about Fuku-chan today! One of the four Morning Musume 9th Generation members! Up till now, Fuku-chan has been on stage with us in Hello concerts as a Hello! Project Egg member. No really, she's reeally a nice kid. That must be the cutest pose I've ever seen. ever. It's just unfair that such a cute girl can do such a cute pose. If this were an online game, they'd nerf her cause this combo is OP. ^and what's making it even more amazing is the fact that she's not posing for the camera, rather it's just her being herself! Natural much? Get in on the fun at the Things Fuku-chan Drew thread! In what one thing will you not lose to anyone? What words or phrases do you like? What doesn't kill you makes you stronger!! In what do you have hometown pride? Tokyo dome and Tokyo tower are there. She'll be 9th gen's artist it seems!! I know I'm certainly looking forward to seeing more of her drawings! I'll just let this speak for itself. <Slack> "who can take over Eri's lines?" <Slack> this is how I know it's getting late. What made you decide to take the audition? I've loved Morning Musume since I was little, so I took the egg audition in 5th grade. This time I thought it was a chance to join Morning Musume, and I applied. How did you feel right when you heard you were accepted? When they said someone from the eggs, I was sure it wasn't me, so I was really shocked. Tell us about when you first met the Morning Musume Members. I thought Michishige-san is really kind and funny. Takahashi-san was very kind, Mitsui-san was smiling the whole time; I had this image that Niigaki-san would be very strict when we were together practicing lessons but she is also very kind. I thought Tanaka-san's accent is really cute. Riho-chan left the impression of being a really good dancer. Erina-chan seemed quiet at first but she actually has a very vibrant loud voice (lol). 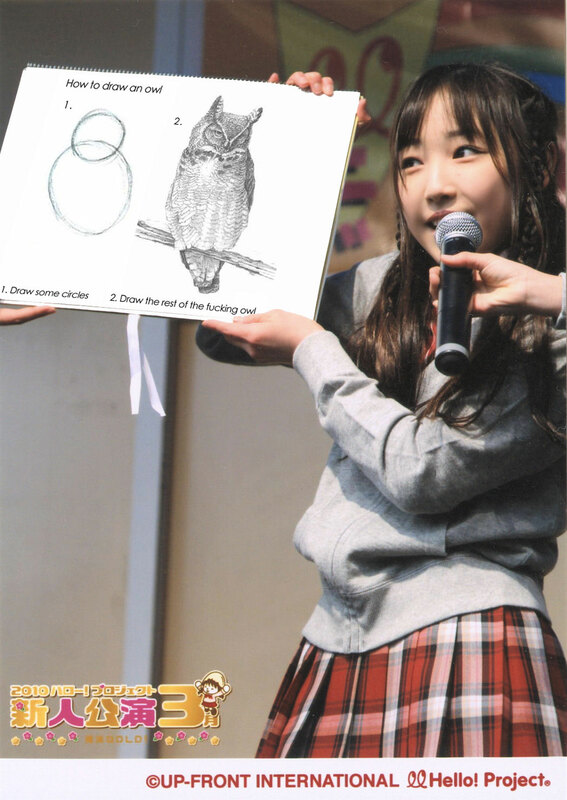 I thought Kanon-chan was funny from when I saw her do her one minute play during the auditions. I want to become a person who can sing sad and happy songs. I am going to be aware of myself as a Morning Musume member from now on, and work to distinguish myself within the group. It seems a lot of people who didn't know about Fuku-chan were surprised at her being left-handed. Her drawings are really good too. Will share them when I gather them all together later. Short messages from the girls, from Morning Musume's Youtube channel. Check Here for the other girls' vids. Page created in 0.452 seconds with 19 queries.